The "HIDDEN MESSAGE TECHNOLOGY" feature is the most common and least dependable security feature. 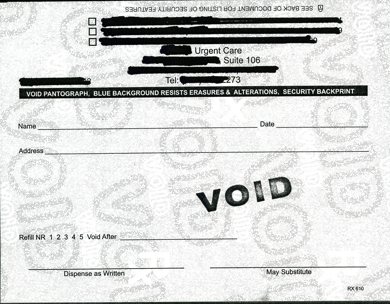 Words such as VOID and UNAUTHORIZED COPY should appear when a document is copied. However due to changing copier and scanner technology, you may find that a copy can be made without the hidden message appearing. This feature DOES NOT WORK 100% of the time on 100% of the copiers. Other words may be hidden in the background. Note ~ As with all Document Security Paper, anything printed on the paper is still legible on the copy. This technology incorporates the use of TWO hidden messages. When lightening the image on the photo copier, the Large VOID appears on the photocopy. Should you darken the image, the small VOID appears. ONCE AGAIN IT IS IMPORTANT TO NOTE that copier technology is ever changing. 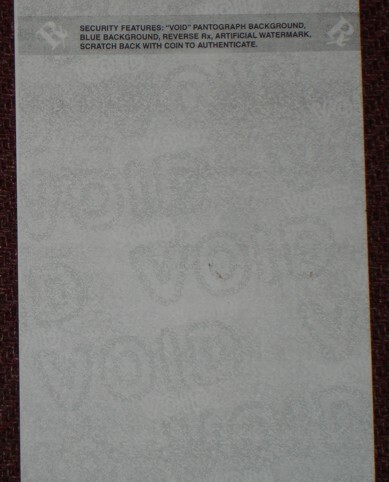 "Hidden Message VOID technology" does not work 100% of the time on 100% of copiers (standard and color copiers) and scanners. To make the void appear, often the pantograph is printed where by the "VOID" may be seen lightly in the background on the original. 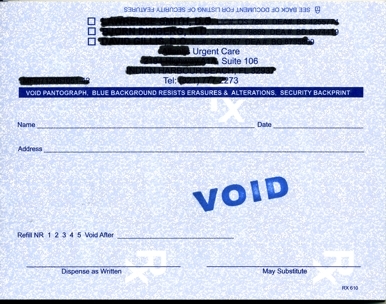 When a prescription pad is cut using a guillotine cutter from the four-up sheet on which it was printed, the distance from the edge of the sheet to the White Reverse Rx may vary slightly. When printing with an offset press, depending upon ink flow, the intensity of the blue color may vary between production runs as well as within the same production run. A slight variation in the intensity of the colored background will impact of how the hidden message will appear when copied. The manufacturers of high quality copiers such as Xerox and Canon are in the business of making "accurate copies," exact reproductions of an original. Should the "VOID" appear, the copy is no longer an "exact" reproduction. Rather it is a "bad copy."